Warning: The following interview will make you hungry. Even though it's focused on a brand new comic book series co-created by my mate Terry, the interview itself is chock full of all the natural ingredients you'd expect from any wholesome plate of food. It has words. It has adjectives. It has a semicolon. But most importantly of them all, it has a soul, a comic book soul. Terry, it's now over to you, pal. 1) Please tell us a little bit about yourself, Terry, plus what is your role in ‘Black Streak Kitchen Comics’? I'm the co-creator of Black Streak Kitchen Comics, along with my brother, Justin, and our friend Joshua Carelly. 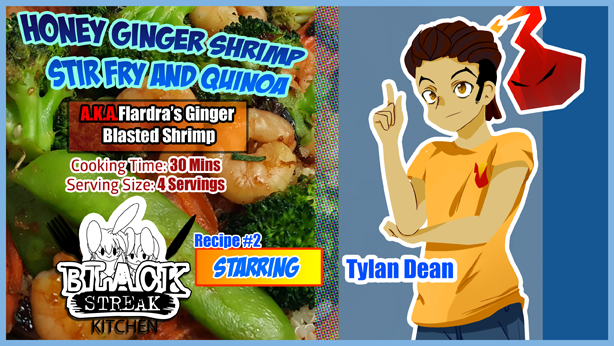 Josh is a chef, so he and I write the recipes featured in our comics. I then take the recipe and re-write it as a comic script, only for Justin to take the script and bring it to life as a comic. Each of us has our own talents that we contribute to each issue. It's a collaborative effort that we are very proud of. 2) What inspired the creation of this culinary themed comic book series? Under our parent brand, Black Streak Entertainment, we publish a graphic novel series (Fiji Random) and a YA book series (Knights of 2nd Earth). I was watching TV one Saturday afternoon and saw a commercial for a recipe delivery service. 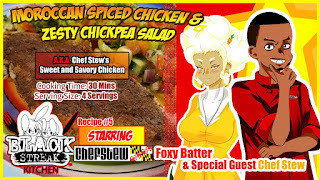 It got me thinking, "It would be dope if Justin and I could apply our characters to cooking somehow", and the idea grew from there. 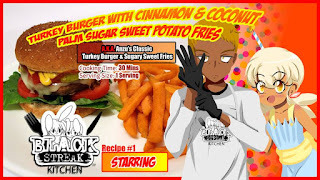 The character chefs featured in BSK Comics are original Black Streak Entertainment characters from the comics and novels that we have published, so they add a lot of personality, excitement, and fun to our recipe comics. 3) Can you name us some of the celebrity chefs involved in these comic books, and how involved are they? We currently have 4 published issues featuring celebrity chefs. The celebrity chefs write recipes for us, and we turn them into comics! These guys are some of the best in the culinary industry, as they all care about the communities where they live and work, and they do so much to empower the youth of their communities. 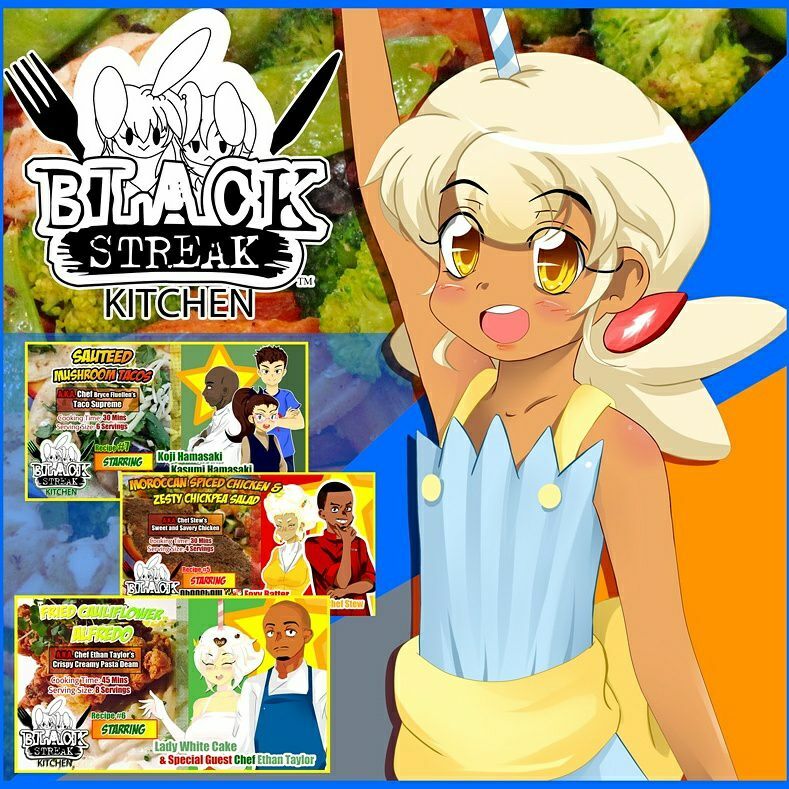 I'm honored that they see our talent and admire what we do, so much so that they're partnering with us to bring Black Streak Kitchen Comics to the world. Chef Bryce Fluellen is a chef and instructor for the American Heart Association in Los Angeles. He is also a founder of Kids At The Table, a series of pop-up dinners that teaches students living in food deserts about cooking and healthy eating. Chef Stew is the winner of the Food Network’s Cutthroat Kitchen and has also competed on Guy’s Grocery Games. He has worked as a personal chef on the set of numerous BET shows and productions. Additionally, Chef Stew is a founder of Transition Kitchen, a culinary arts school that trains children, young adults, and ex-offenders, and helps them gain employment in the culinary industry through staffing agencies. Chef Taylor is an L.A. celebrity chef who has catered to celebrities like Jamie Foxx, Justin Bieber, Kanye West, Kim Kardashian, and more! He's also an Executive Chef of Great EETs North Hollywood. Chef Harris is the winner of the Food Network’s Cutthroat Kitchen and Iron Chef International. 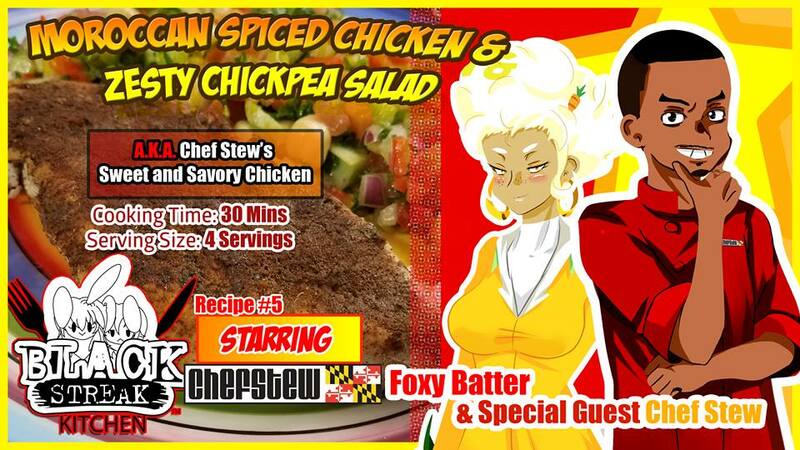 He's also a founder of Chef Life Consulting in Atlanta, GA.
4) What signature dish would you say best represents this comic book series and why? I would say "Moroccan Spiced Chicken and Zesty Chickpea Salad" by Chef Stew. It's a dish diverse in its flavors and geographic origins. It has the sweetness of earthy spices like cinnamon and allspice, the refreshing citrus zest of lemon, the crispness of veggies like cucumber and carrots, and the comforting taste of chicken. BSK Comics stresses the importance of spices and geographical diversity in foods, as we want to keep things interesting and encourage people to be creative in the kitchen, to unlock new levels of flavors in their dishes. Cooking is made all the more enjoyable when you combine diverse ingredients together to create a culinary masterpiece. 5) If you could get a celebrity – either living or dead – to promote your wares, who would you choose, and why would you want to choose this particular person? Beyonce, definitely. Her fanbase is loyal and everything she touches turns to gold. 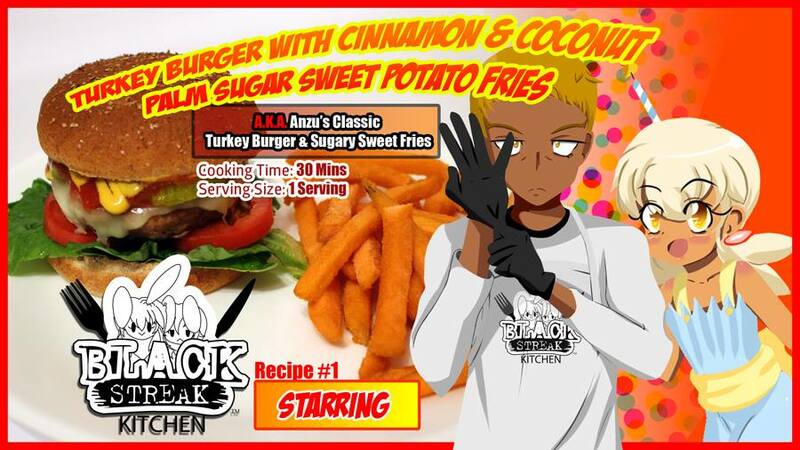 Also, she’s a mother herself, so I’m sure her connection to our brand would draw more mothers to Black Streak Kitchen. 6) During your time in this field, what is the one thing that has kept you in good stead? Quite a lot, I think, such as hearing the stories from mothers and kids who love our comics, seeing the excitement on kids faces when we share BSK Comics with them at school speaking events, as well as seeing the excitement for our work. That keeps me motivated, no doubt. 7) If ‘BSKC’ had a personal motto, what would it be? Real recipes by real celebrity chefs in the form of comics! After all, that’s what we do. 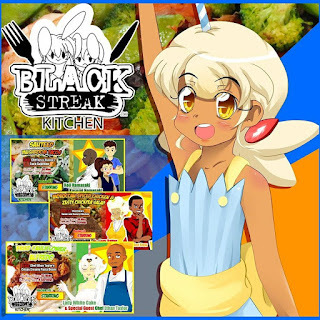 And on that note, I'd like to thank Terry for telling us about Black Streak Kitchen Comics, before directing you towards their official website, facebook, twitter, and instagram pages. Go on, have a click, as I'm sure your appetite will thank me for it later.